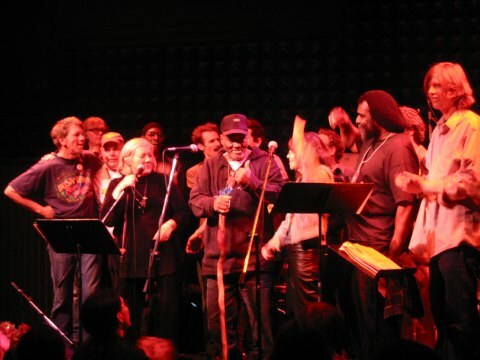 Saturday, March 1st, 2003 Joe's Pub at the Public Theatre in New York played host to a unique event celebrating the protest-song tradition. Much of the repertoire was drawn from the definitive collection, The Vietnam Songbook, compiled and originally published in 1969 by Barbara Dane and Irwin Silber. Music and lyrics have always played a role in reflecting and influencing culture and society. Throughout much of the 20th Century political and social movements were documented and defined by song. Notably, Aunt Molly Jackson and Woody Guthrie passed on a tradition of writing and performing protest songs that continued through Pete Seeger, Barbara Dane, Bob Dylan, Billy Bragg and many others. The “people’s songs” of the 1930’s and 40’s influenced the civil right’s song’s of the 50’s and 60’s, which grew in a common form of expression against the Vietnam War in the 60’s and 70’s. Never before had the protest song form been generated by such broad-based artists. Folk, Rock, Soul, even Top 40, protest songs became a common form of expression. On the eve of war in 2003 it seemed that any artists or musicians who spoke out against the current administrations policies were quickly shouted down in the media and warned that their job was to entertain, and that politics was best left to politicians. We felt that the protest song as a viable form of political discourse was severely challenged and decided to put on a concert, and show, by example, how people had once been able to express their thoughts. Our guide was The Vietnam Songbook, compiled and originally published in 1969 by Barbara Dane and Irwin Silber. It was an incredible, comprehensive collection of more than 100 protest songs concerning the Vietnam War. Joe's Pub at the Public Theatre in New York played host to this unique event celebrating the protest-song tradition on Saturday, March 1st, 2003. The evening featured musical performances by artists who've experienced the '60's anti-War movement including Barbara Dane, Pete Seeger, Tuli Kupferberg, Bev Grant and Matt Jones along with noted Vietnam Vet/musicians Watermelon Slim, Joe Bangert, Noble I'm Manu El:Bey and younger musicians such as Thurston Moore, Jenni Muldaur, Barry Reynolds, Jim O'Rourke, Stephan Smith, Dean Wareham, David Licht, Lenny Kaye, Curtis Eller and Dan Zanes. These artists came together to raise a collective voice with songs of protest, hope and redemption. They were keenly aware of the parallels between the Vietnam War and the wars that continue to be waged. This performance and the documentation of it through photos, audio, video and oral histories stand as a lesson and tool for reminding all people of the futility of war. All music and image rights remain with the artists and their representatives. Please share, don't sell.